A recent market study published by company – “Oral Solid Dosage Contract Manufacturing Market: Global Industry Analysis 2013–2017 & Opportunity Assessment 2018–2028” – consists a comprehensive assessment of the most important market dynamics. On conducting a thorough research on the historic as well as current growth parameters of the oral solid dosage contract manufacturing market, growth prospects of the market are obtained with maximum precision. The report features unique and salient factors that may have a huge impact on the development of the oral solid dosage contract manufacturing market during the forecast period. It can help market players to modify their manufacturing and marketing strategies to envisage maximum growth in the oral solid dosage contract manufacturing market in the coming years. The report provides detailed information about the current and future growth prospects of the oral solid dosage contract manufacturing market in the most comprehensive way for the better understanding of readers. The report commences with the executive summary of the oral solid dosage contract manufacturing market, which includes the summary of key findings and key statistics of the market. It also includes the market value (US$ million) estimates of the leading segments of the oral solid dosage contract manufacturing market, key players and market dynamic snapshot. Readers can find detailed taxonomy and the definition of the oral solid dosage contract manufacturing market in this chapter, which will help readers to understand the basic information about the segments of oral solid dosage contract manufacturing market and list of key market participants included in the report. This chapter provides readers with information about the most important macroeconomic and microeconomic factors that are instrumental in shaping the oral solid dosage contract manufacturing market. It helps readers to understand the critical market opportunities for at all nodes of value chain in global market. This chapter includes snapshot on gross domestic products of prominent countries across seven regions in the scope of the report. This section includes the evolution of market in past few years and current industry trends. Readers can find detailed market dynamics of the oral solid dosage contract manufacturing market in this chapter, It helps readers to understand the critical market dynamics such as drivers, challenges, market trends, and opportunities for market players in the oral solid dosage contract manufacturing market. This chapter includes detailed analysis of the growth of the North America oral solid dosage contract manufacturing market along with historical market analysis and forecast. Readers can also find regional market dynamics and trends. This section also includes the growth prospects of the oral solid dosage contract manufacturing market in countries such as the U.S., and Canada. The market performance of oral solid dosage contract manufacturing in North America is discussed on a country level (Brazil, Mexico, Argentina & rest of Latin America) in this section. The section also provides insights on regional market drivers, challenges and trends in Latin America oral solid dosage contract manufacturing market. This section provides country wise analysis of oral solid dosage contract manufacturing market in Western Europe. Countries covered in this section are Germany, Italy, France, U.K., Spain, and rest of Western Europe. Market attractiveness analysis by country is provided to identify potential of growth for key players in the market. The section highlights regional market drivers, restraints and trends for oral solid dosage contract manufacturing market. This chapter of the report introduces oral solid dosage contract manufacturing market in Russia, Poland and rest of Eastern Europe by providing detailed information about the growth avenues for market players in the region and growth prospects of the market based on its leading segments. China, India, ASEAN, and Australia & New Zealand are the leading countries in the APEJ region that are the prime subject of assessment to obtain growth prospects of the APEJ oral solid dosage contract manufacturing market in this chapter. Readers can find thorough information about the growth parameters of the APEJ oral solid dosage contract manufacturing market during the period 2018-2028. Readers can find important factors that can make a huge impact on the growth of the oral solid dosage contract manufacturing market in Japan This chapter provides the overview of drivers, restraints, and trends in the Japan oral solid dosage contract manufacturing market. This chapter provides information on how oral solid dosage contract manufacturing market will grow in the major countries in MEA region, such as GCC Countries, South Africa, and rest of MEA during the period 2018–2028. This section provides a dashboard review of competition in global oral solid dosage contract manufacturing market. It details the comparative assessment of key service offerings to market segments and competitive position of key players in the global market. Readers can find a comprehensive profiles of key players in oral solid dosage contract manufacturing market, including company overview, revenue shares, strategic overview, and recent company developments, production capacity and production base etc. Market structure analysis is provided to understand degree of competition in global oral solid dosage contract manufacturing market. Market players featured in the report include Recipharm AB, AbbVie Contract Manufacturing, Patheon N.V., Catalent Inc., NextPharma, Capsugel (Lonza Group AG), Aurobindo Pharma Limited (AuroSource), Siegfried AG, Piramal Pharma Solutions, and CordenPharma, among others. With the geographical perspective, global oral solid dosage contract manufacturing market is analysed on a total of seven regions viz. North America, Latin America, Western Europe, Eastern Europe, Asia Pacific excluding Japan, Japan and the Middle East and Africa (MEA). Historical trends in the oral solid dosage contract manufacturing market and their effects on global market performance is discussed in this chapter. Based on dosage form, the oral solid dosage contract manufacturing market is segmented into tablets (further sub-segmented in to immediate release, modified release, chewable tablets, effervescent tablets etc. ), capsules (further sub-segmented in to hard gelatin capsules and softgels), powders & granules, lozenges & pastilles, gummies, etc. In this chapter, readers can find information about key trends and developments in oral solid dosage contract manufacturing market and market attractive analysis based on dosage form. Based on the end user, the oral solid dosage contract manufacturing market is segmented into big pharma or Biotech companies, small & medium-size pharma or biotech companies, emerging or virtual pharma companies and nutraceutical Companies. In this chapter, readers can find information on how demand from each of these end users is shaped. This chapter helps readers to understand the research methodology followed to obtain various conclusions, important qualitative information, and quantitative information about the oral solid dosage contract manufacturing market. The U.S.-based pharmaceutical companies incur high cost for research and development of new chemical entities. These efforts to increase the research capabilities have led to mergers, which ensure the required production capacity for new chemical entities (NCEs). However, this rationalization approach is also extending outsourcing of primary (API) and secondary (formulation) manufacturing. Outsourcing of secondary manufacturing of branded products also results in approximately 40% to 60% cost saving to the innovator company. Other than cost saving, innovator companies are also looking on to scale-up operations. On the other hand, oral solid dosage contract manufacturing organizations (CMOs) are trying to integrate themselves into the value chain of pharmaceutical companies. CMOs are building dedicated facilities or capacities for pharma companies, who prefer not to build it themselves. This new model of sharing construction, operations, technologies & functions and building groundwork for long-term manufacturing partnerships is expected to drive the growth of oral solid dosage contract manufacturing market in North America. In oral solid dosage contract manufacturing, information such as product formula has to be transferred from client (innovator) companies to suppliers (CMOs). This involves the risk related to data confidentiality and exclusivity. Manufacturing of finished dosage form is typically based on short-term contracts with service providers and there are chances that the service provider may become a competitor once the contract ends. Moreover, the buyers have to pay high switching cost to the service providers due to need for compatibility with the manufacturing equipment required. This is expected to limit the growth of global oral solid dosage contract manufacturing market. Due to highly fragmented nature of the oral solid dosage contract manufacturing market, CMOs need to seek out new ways to differentiate their services from competitors and provide value-added services. Oral solid dosage contract manufacturing organizations are facing enormous pressure to achieve financial results and profits due to many reasons such as under-used supply chain, challenges to meet regulatory standards, etc. Oral solid dosage contract manufacturing organizations are competing for the same customers in an environment of increasing margin pressure and competition from new entrants. Majority of CMOs are looking to offset the differentiation through transforming from CMOs to CDMOs. In the last decade, the oral solid dosage contract manufacturing market has seen number of mergers and acquisitions. For instance, in July 2017, Lonza completed the acquisition of Capsugel LLC, which made the company a leading integrated service provider to the pharmaceutical companies. Most of the companies have grown by acquiring manufacturing plants, which are no longer strategic to the pharmaceutical companies. Despite of this, the global oral solid dosage contract manufacturing market is extremely fragmented and has large number of small CMOs. Consolidation will help the pharma companies to access all their formulation or drug development related activities at one-stop-shop. This section of the report features profiles of the key players operating in the oral solid dosage contract manufacturing market based on their market shares, differential strategies, service offerings, production capacity & production bases, and company dashboard. Examples of some of the key players featured in global oral solid dosage contract manufacturing market report include Recipharm AB, AbbVie Contract Manufacturing, Patheon N.V., Catalent Inc., NextPharma, Capsugel (Lonza Group AG), Aurobindo Pharma Limited (AuroSource), Siegfried AG, Piramal Pharma Solutions, and CordenPharma, among others. Oral solid dosage contract manufacturing includes services that provide third-party manufacturing of pharmaceutical oral solid dosage formulations including tablets, capsules, powders & granules, and lozenges, among others. The company conducted a research study on the global oral solid dosage contract manufacturing market for the forecast period 2018 to 2028. The report offers a comprehensive evaluation of the business opportunities prevailing in the oral solid dosage contract manufacturing market along with insights on the market dynamics, market trend and opportunities, regulatory scenario, and others. The report elaborates the macroeconomic factors influencing the dynamics of oral solid dosage contract manufacturing market and its futuristic potential. For the better understanding of readers, the report on oral solid dosage contract manufacturing market provides salient information about oral solid dosage contract manufacturing market in the most comprehensive manner. 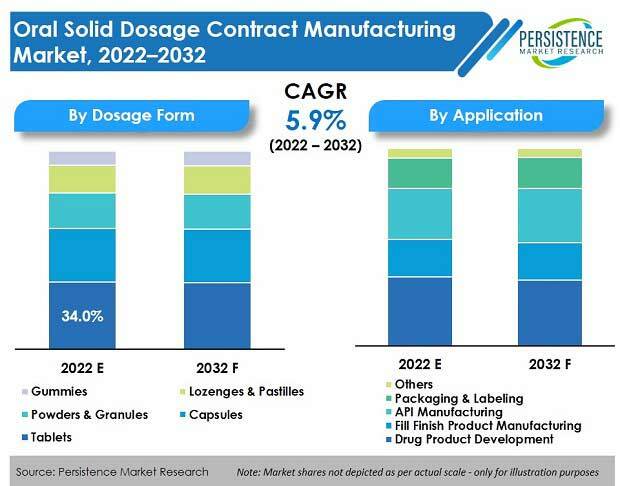 The oral solid dosage contract manufacturing market is segmented based on geography, dosage forms, and end users/customers, to analyze the segment-wise growth of the market. Based on geography, the global oral solid dosage contract manufacturing market is segmented into seven regions – North America, Western Europe, Eastern Europe, Latin America, Asia-Pacific Excluding Japan (APEJ), Japan, and the Middle East & Africa (MEA). By dosage form, the oral solid dosage contract manufacturing market is segmented into five dosage forms, viz., tablets (further sub-segmented in to immediate release, modified release, chewable tablets, effervescent tablets etc. ), capsules (further sub-segmented in to hard gelatin capsules and softgels), powders & granules, lozenges & pastilles, gummies etc. Based on end users/customers, the global oral solid dosage contract manufacturing market is segmented into big pharma or Biotech companies, small & medium-size pharma or biotech companies, emerging or virtual pharma companies and nutraceutical companies. What is the revenue potential of the oral solid dosage contract manufacturing market across regions of North America and Europe? Who are the key players and their service portfolio and strategy in oral solid dosage contract manufacturing market? What are major challenges influencing the growth of oral solid dosage contract manufacturing market? What are major trends in the oral solid dosage contract manufacturing market? What are the production capacities of key players in oral solid dosage contract manufacturing market?